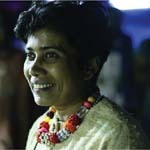 Prajapati, Uma is the Founder of Upasana Design Studio in Auroville. Her interests lie in designing for social development and she was the initiator for the Tsunamika project that brought into sharp focus the plight of the victims of the Tsunami. A graduate in Economics with a Diploma in Fashion Design from NIFT. New Delhi she has worked on a wide range of projects including Small steps, a project for the development of the Varanasi Weavers and design work for many NGO. She is Visiting Faculty at several Design Institutes. Recycling, Upcycling, Sustainability, Sustainable Devt.